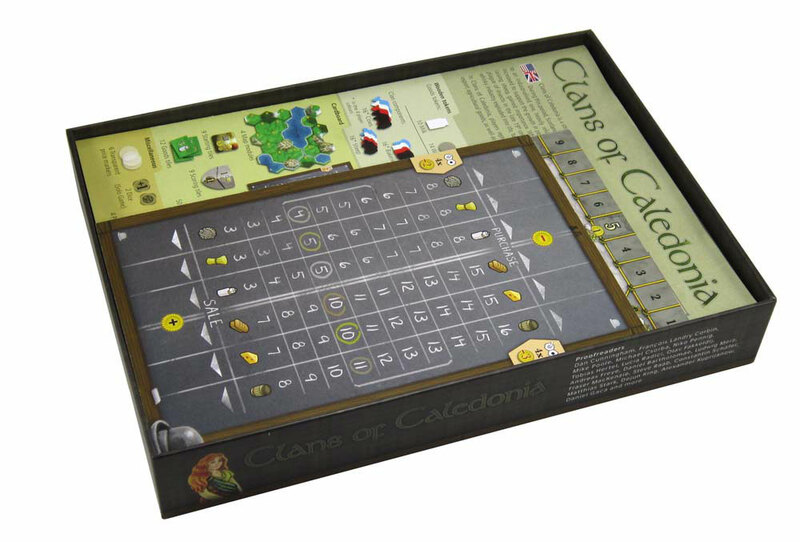 Compatible with Clans of Caledonia®. This three sheet product was a part of Kickstarter Campaign 3 and will be available on our store from May 1st. 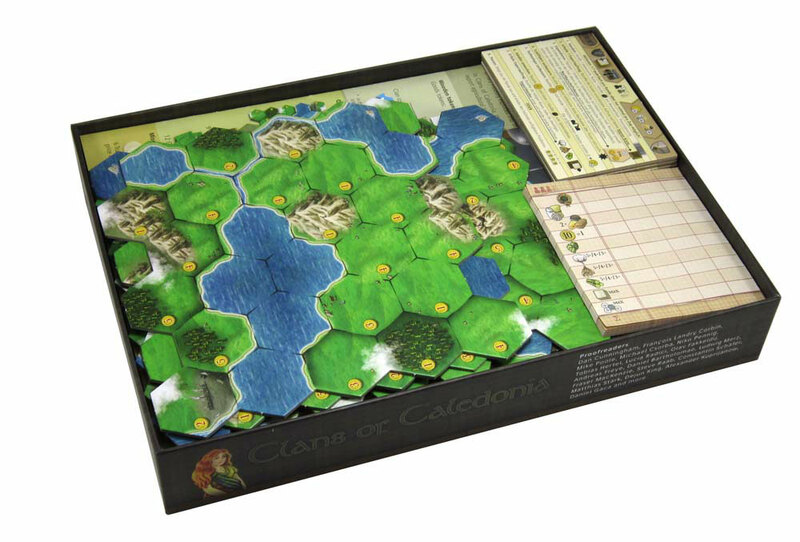 This Campaign 3 insert is designed to be compatible with Clans of Caledonia®. The design provides both efficient storage and improved game play. Many of the trays can be utilised during the game, and they greatly aid set-up and clear-away times. The rules and boards act as a lid on top of the trays. With the top layer removed you can see the second layer of trays underneath. Each clan has it's own tray for its coloured components. These are the trays for the clans and the goods tokens. 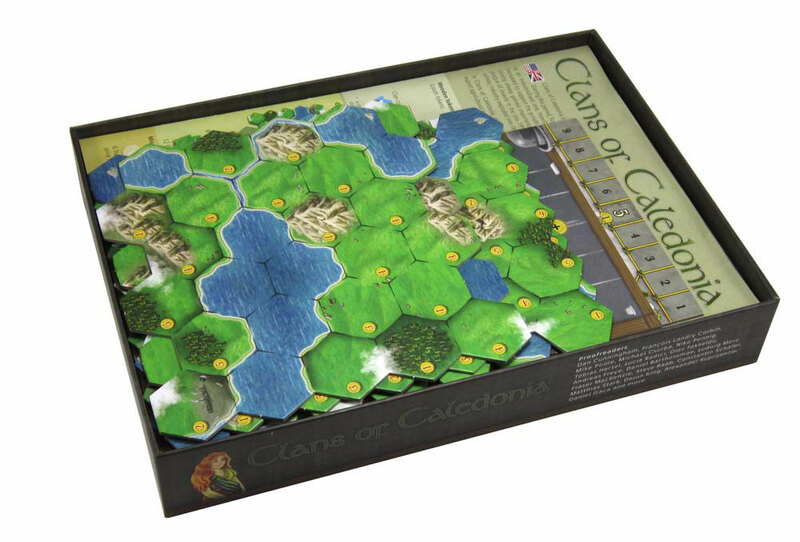 Each player will take a tray with his chosen colour of clan pieces at the start of the game. The goods tokens each have separate slots to give easy access during the game. These are the other trays for the remaining game components. There is one long tray for the export contracts and scoring tiles. There are two trays for the coins, a tray for the clan tiles, and a tray for the port bonus tiles and other game pieces. 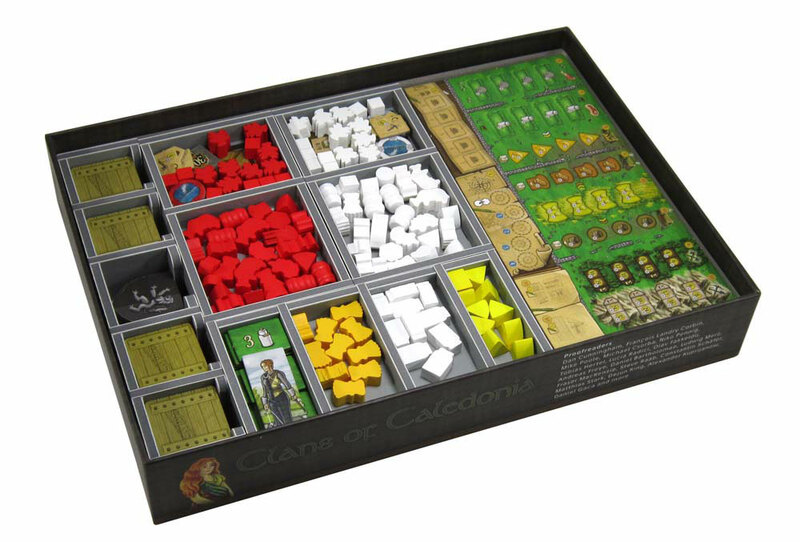 As mentioned above many of the trays can be used during the game to organise the components and make access by all players easy. This game boards need to be placed in the box in the following sequence. First go the player boards in a recess at the top of the insert. Then go the rules, followed by the market and export boards. The map boards go last, with the player aids and score sheet next to them. This product consists of a flat-pack of 3 Evacore sheets. The trays require assembly, which is quick and fun, using ordinary PVA glue. Detailed instructions are included in the package. For general assembly tips click here. Folded Space is here to bring to you board game inserts that are affordable, lightweight and add improved game play and storage to many of your favourite games.